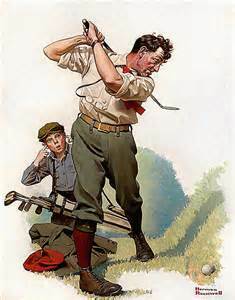 This Norman Rockwell golfer has better swing fundamentals than I was blessed with. I attended my second ever golf lesson Thursday night with Mike over at Man O’ War Golf. I approached the session with a modicum of confidence because I had worked diligently on the key points from my first lesson. I had gone to the practice range 5 or 6 times in the two weeks since the first lesson to concentrate on my stance and setup. At the outset of my first lesson, Mike gave me the choice of either working on my existing swing to be able to play a little better or letting him help me construct and execute a more traditional golf swing. Boy, am I glad I chose option two! It turns out almost everything in my backswing was wrong. I knew I had some swing flaws, but once I saw myself on camera, I was astonished that I’d been able to hit the ball as well or as far as I had last year. It was amazing how far what I thought and “felt” I was performing in my golf swing varied from what the video evidence proved I was actually doing. Poorly. The side-by-side video comparison of me with Rory McIlroy was just depressing; a plow horse would look more natural in the starting gate of the Kentucky Derby Laughingly, Mike acknowledged that Rory is a human pretzel composed primarily of rubber bands and titanium wires, and that he didn’t expect me to be able to reproduce what I was watching on the screen. But I’m finding the video feedback remarkably helpful in visualizing whatever point I’m trying to wrap my mind around. The specific list of mechanical flaws in my swing included swaying and sliding my hips away from the target instead of turning my upper body and loading up on my right side. Despite conquering the proper set-up position from the first lesson, I was performing a reverse, or negative, tilt during my swing. I was actually corkscrewing my body to the point that my head and upper body tilted towards the target severely at the top of my super-elongated backswing. This swing sequence photo of Aaron Baddeley from 2007 vaguely represents what I had been doing. Unwittingly, I had incorporated the exact body movements as someone trying to execute the Stack and Tilt golf swing. That would have been fine if I’d known what the Stack and Tilt actually was before this tonight’s Google search on “negative tilt.” Basically, I slid my hips so far to my right and lifted my hands so far toward the target behind my head that I had contorted into a “C” before descending the club towards the ball. Unfortunately, this is not the Reverse C golf swing that Johnny Miller is prone to wax poetically about on your Sunday afternoon golf telecast. Mike explained that our goal was to have my upper body actually tilting to the right, away from my target, while simultaneously turning my hips without any lateral slide to the right. Actually, he was asking me to slide my hips left as they rotated to the right. Let that sink in. Yes, I was being asked to move my body in diametrically opposite directions simultaneously. My initial impression was that he might as well ask me to stand on my head and touch the ceiling. As bad as that sounds when read aloud, the fix was actually pretty simple, and familiar. Performing the “swing the bucket” drill, so succinctly described in Harvey Penick’s Little Red Book, along with two other simple drills designed to tilt my body and widen my swing arc, had me literally straightened out and corrected my spine angle in no time. I made it from negative tilt to straight up and down after about five minutes of drills and test swings. After another 10 minutes, the video monitor revealed I’d made it to about 7 or 8 degrees of tilt in the correct direction. Without the professional eye and a room with a wall full of mirrors and cameras, I would have never been able to fully appreciate what Mike or Penick were trying to convey. Unfortunately, that was not the end of the lesson. At my core, 17 years removed from the diamond, I remain a washed up baseball player. There are certain swing principles concerning power and leverage that can carryover from a baseball swing to the golf course successfully. Then there are the ones I had incorporated into my golf swing. Much to my surprise, my body thought this was the position and stance from which to model a golf swing. In baseball, you try to adopt the following basic swing sequence: separate your hands from your body, stride, clear your hips, and keep your hands back as long as possible until the ball is in the hitting zone. Without realizing it, or the consequences, I had copied this exact swing sequence on the golf course. In order to make any kind of contact with the ball, this convoluted series of movements required me to raise my hands and right elbow well above shoulder level, sometimes even above my head. 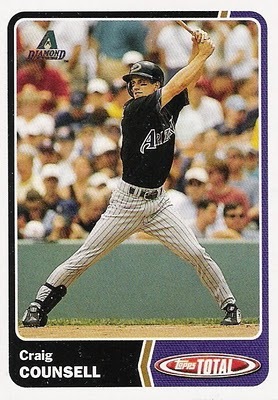 Even The Wife, avid non-golfer that she is, said that my former swing at the top looked a lot like Craig Counsell’s stance in the batter’s box. Fortunately, Mike had a few simple, if painful, drills to reverse my timing sequence and really release the power in my hands. After another 20 minutes, I was tilting (uncomfortably) far to the right, rotating properly, and releasing the power stored in my core to produce a relatively straight, high ball flight. I have to consciously try to begin my downswing with my hands because my feet, hips, and shoulders all want to revert to their natural baseball swing sequence. As a result, the tension in my core now “plays to 11,” and my hands are moving much, much faster at impact. On the occasions that I perform this new swing properly, the club makes a sound and produces a ball flight with which I am unfamiliar. I would watch the ball fly and think “I didn’t know I could do that.” Actually, I was pretty sure I couldn’t do that. Whoops. After only two lessons, I am very satisfied and impressed with the instruction I’ve received. I feel like my pro is being honest with me about my golf swing, and I’m hearing what I need to hear, even if it’s not what I want to hear. It is humbling to consider how much I didn’t know or was just flat wrong about concerning a proper golf swing. The damage to my pride and ego deflation occurred weeks ago, when I finally picked up the phone to schedule the first lesson. So, like the hungry man that will gratefully eat anything, I’ve been comfortable trying anything Mike suggests, no matter how awkward it feels. He always has two or three different ways to explain the next concept to me, which is very effective for the way my mind works. The feedback I receive has been incredibly positive and encouraging without coming off as disingenuous. As one would expect from a professional, be it a doctor, lawyer, or golf professional, Mike has been great about framing and tempering our mutual expectations. When I get the desired result a little quicker than expected, I get to feel good about it. When it takes me a little longer, we work on a different approach or with different terminology. Tonight, I also received a little more of a road map of where all of this golf instruction would lead. We went over what I was working on and what was coming next from the metaphorical “1,000 feet above” view. Blame it on my approach to problem solving, but I had to know what the ultimate answer was before I asked the question, where the journey ended before it really began. The bottom line is that I had a lot of “bad” muscle memory built into my golf game, and as cliche as it sounds, I was going to have all of it broken down and rebuilt, better, stronger, faster than I was before. There aren’t any shortcuts or substitutes for practice. But I’m genuinely giddy with the results thus far, and I can’t wait to discover the next thing I didn’t know. Great post! 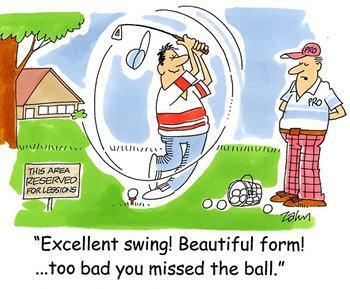 I like how you describe the how your lessons affect your golf swing! I am looking forward to future updates.